As part of the ‘Your UK Parliament Award’ some of our BHASVIC ESOL students have won ‘The Community Campaigner Award’. Current students, Nisar Gul, Tariq Khan, Wasim Al Yousef (now studying A-levels) and ex-student Naqeeb Saide are among the group of 5 young refugees to be honoured. All of them travelled across Europe alone as minors before reaching the UK in 2016 and since then have campaigned to highlight the difficulties refugees face and work toward change in the refugee system. Through the local youth-led charity The Hummingbird Refugee Project, they have organised and attended events locally and around the country, including meeting with MPs to speak about the rights of refugees. 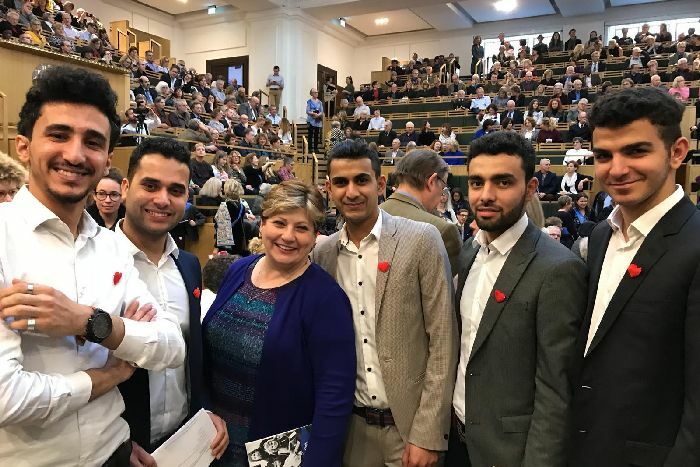 On the day of the award Nisar Gul (pictured second from right) was offered an apprenticeship with the Speaker of the House of Commons which he will be starting in September.